This is Saturday. My studio is Open to the Public, as it has been on Saturdays for the last month. Signs out on the street, and at the top of the path down to my door. This place is off the beaten path of the village of Freeland, so folks don’t just automatically pass by; I have to entice them. A few have come today, but no buyers. Still, they’re interested by the process, and attracted to the product. They won’t forget . . . . 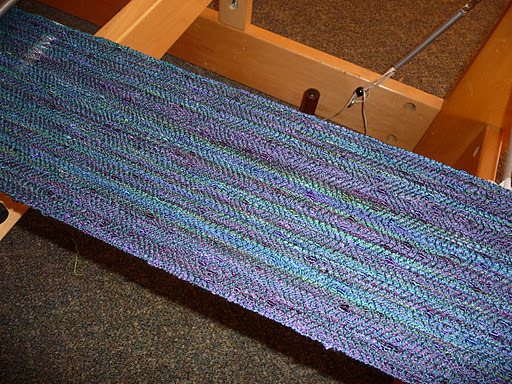 The series of photos below shows the beginning of the “Merlot” scarves. 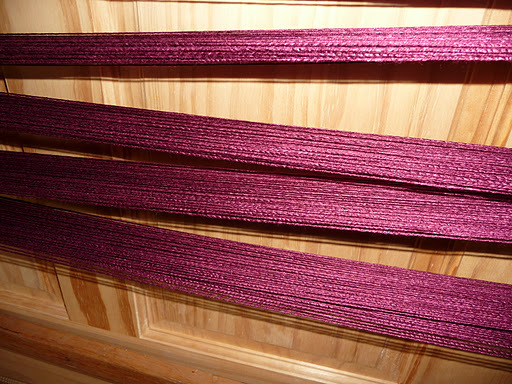 A deep wine 100% bamboo, shown first on the cone, then measured out as a nine-yard warp on the warping board, enough for four scarves, each with a different weft and pattern. 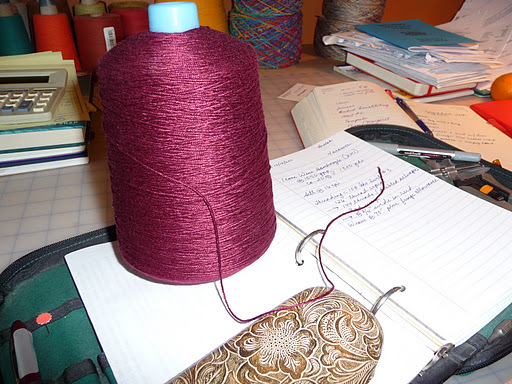 Related, but nowhere near identical — the story of my weaving life. 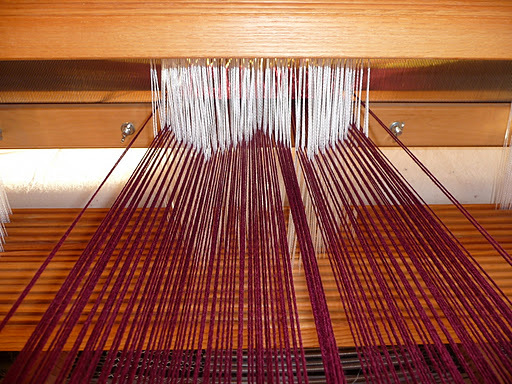 Looking at the threaded and tensioned warp from the back of the loom — an interesting perspective on threads and heddles, which gives a wee hint of the curvature of the threading sequence. 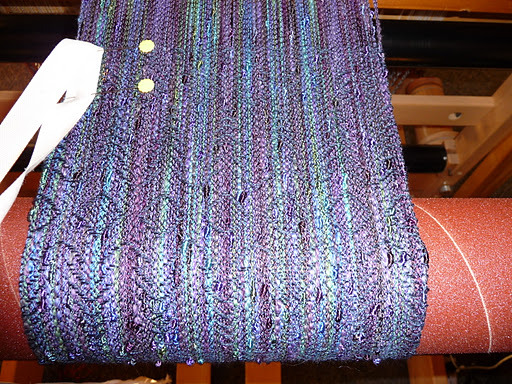 That’s a simple 12-shaft point twill threading, on which I’ve been weaving quite complex advancing twill treadlings, to make long motifs that interlock both horizontally and vertically. 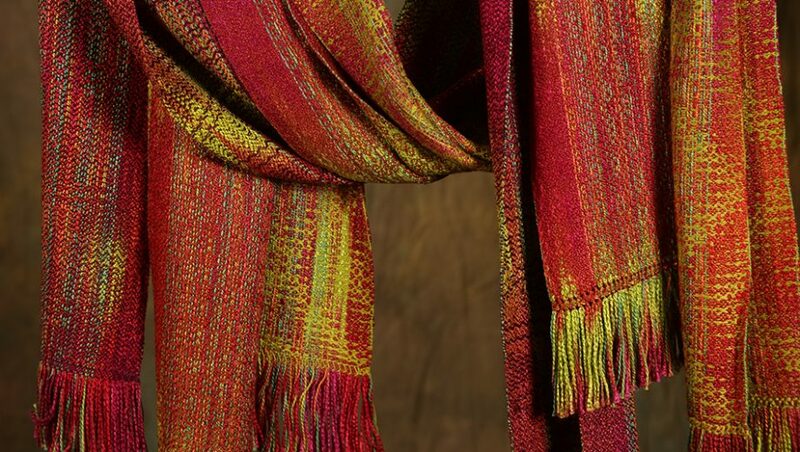 Hard to see on all that color and texture, but it all peeks out when the light hits it just right. and this is the third (and last) one, still in process, with the pattern partially visible and the high-tech measuring device at the left edge. The Summer Nights series will be done Monday, and off the loom for washing and detailing (as I call the rest of the process of getting them ready to be sold). The Merlot series will certainly be done before the end of the year, and probably well before at the rate it’s going. 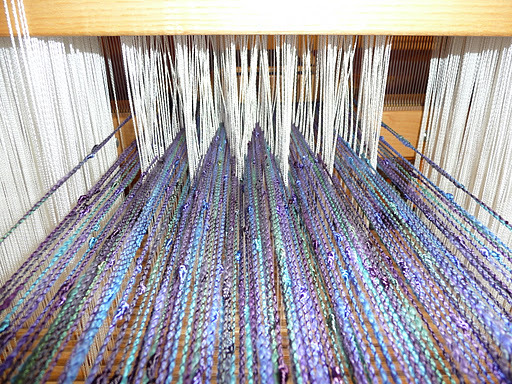 The next warps for both looms are all planned and the patterns designed, so that the empty-loom time will be minimal. I’m on a roll these days now that all the seasonal shows are done, and life in general seems to be slowing down — in keeping with the season — and I’m going to ride this wave while it’s still carrying me so splendidly. Time later on for some goofing off, which will allow me to catch up on a hefty backlog of reading.